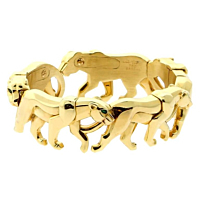 Cartier is know for its love affair of Panthers and it has rubbed off on its fans as their Panthère de Cartier collection has become somewhat of an icon over the years. This brilliant piece was quite the find and we're extremely happy to have this to offer our clients. Made from 18K Yellow Gold and set with a stunning Tsavorite which is the signature of the Panthère collection.